If you’d like to visit Southwold’s neighbour, Dunwich, you’d better be quick. Every year a little more of the village falls into the sea – it has lost eight churches since 1236. Sole Bay itself was once protected by two promontories, Easton Ness to the north, and Dunwich Ness to the south, but both have now disappeared as the sea eats away roughly a metre of coast every year. 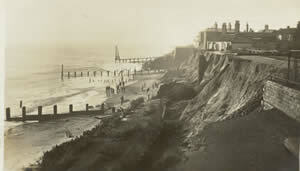 Although the sea has also swept fishermen’s huts and boat-sheds away from Southwold’s beaches, the town has experienced much less erosion than neighbouring areas – almost entirely because of the continuing efforts of residents and authorities to protect the cliffs. In contrast, the village of Easton Bavents was once a prosperous community with a market, a fair and churches. By the 17th century the church of St. Nicholas and most of the houses had been lost to the sea. However, one stunning by-product of the sea’s attacks on Southwold’s beaches and cliffs is the treasure-trove of fossils discovered over the years. Eagle-eyed people have also found deposits of amber (fossilised resin from plants or trees), jet (the mineral-like remains of ancient trees) and petrified wood. In 2006, erosion revealed remains thought to be of 17th century salt pans. More about fossils and amber in our storyline: 'In the beginning'. Meanwhile the erosion of the sand cliffs at Easton continues and there is fear that one day the sea will break through and sweep in towards the town over the marshes from the North. 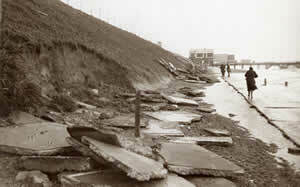 In 1938 Southwold's sea front was again under threat when a storm destroyed much of the promenade. Use the links below to explore Southwold’s other sea stories. The Medieval church of All Saints in Dunwich was almost as big as St Edmund's in Southwold. Its ruins had already begun to tumble into the sea when this photo was taken in 1904 and, by 1919, the tower finally fell in. The last traces of the graveyard behind have only recently been lost. This part of the coastline is now officially scheduled for 'managed retreat' with no plans to protect it. Read about the efforts, that have been made (with mixed success) over the years to protect Southwold from the sea. Whatever happened to Sole Bay?